$155 per couple. 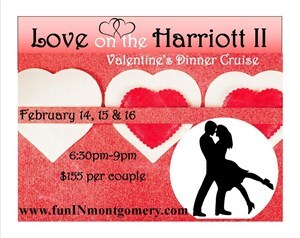 Tickets include 3 roses, surf and turf dinner, live entertainment & champagne w/ commemorative glass. Purchased tickets online or visit the Box Office at 200 Coosa St.
For more information, please call 334-625-2100. Thank You For your submssion. information on the Convention Center District in Montgomery, Alabama.